The Territorial Army Emergency Reserve or the 'Ever Readies' as it was more usually known, was formed after the end of National Service to produce a body of men within the Territorial Army who would be liable to call-up without proclamation and who could be sent to reinforce the Regular Army in an emergency. 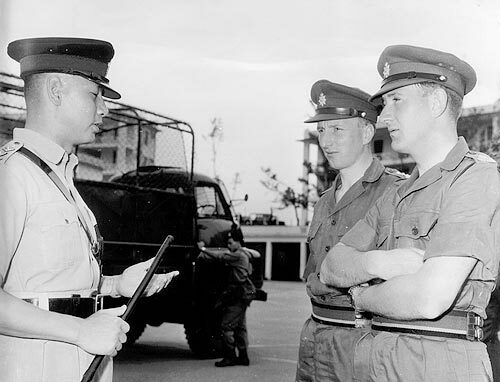 Some men of the 3rd and 4th Queen's Surreys had volunteered for this role,their attachment to the Regular Army would take the place of TA annual camp in 1963 the 1st Battalion in Hong Kong seemed considerably more attractive than, say, camp at Stanford PTA. The men, 100 of them, wearing civilian clothes, reported to Paddington Station on 16th April to be met by their commander Major D G Wilson and Captain D A Robinson as his second-in-command. The party entrained for Swindon, staged overnight in the transit camp, and left by air from RAF Lyneham, Wiltshire in a Britannia aircraft. The party was bid farewell by many VIPs and the Press. Cpl L Constable, an 'old soldier' of the 2/5th Queen's in the 1939-45 War, remembers that the aircraft landed at El Adem, then Aden, then across the Indian Ocean to Gan, an atoll in the Maldives Group, then over Sumatra, landing at Paya Lebar, Singapore. The final lap was now reached, flying the 1,450 miles to Hong Kong and landing at Kai Tak airport. The party was met again by many VIPs and the Press. Major J W Sewell, the Second-in-Command of the 1st Battalion, was there to greet them together with Major J G F Naumann of the Training Company. Crossing by ferry to Hong Kong Island the party gazed at the interesting sight of junks and sampans, the Royal Naval and the United States naval ships in the harbour, and experienced the smells of the place. Everything was exciting and novel. On reaching Stanley Fort the men were made very welcome and met again some of their old comrades who had joined the Regular Army and their ex-Permanent Staff Instructors. After a meal, the party went to the stores to be kitted out with three suits of olive green denim, which had been dhobied and was ready to wear and with the 1958 web equipment, which was new to them. The next morning the Commanding Officer addressed the party. As he had been Training Major of 5 Queen's he was no stranger to many of them. Major Sewell then briefed them on the history of the Colony and the problems with which the Army had to be prepared to deal. He then pointed out on a map the places likely to be seen on exercises. Weapon Training followed and a demonstration was given by B Company on 'Keeping the Peace'. After this there was a talk by an Inspector of Police, followed by an exercise out on to the Sai Kung Peninsula. The men marched up a steep slope to the firing point in a gully. Field firing commenced with fire orders to each section. For some it was the first time they had fired the new self loading rifle. The 3.5 rocket launchers were next on the list. The Energa grenade was fired from the S L R and the men were pleased with the results. After a meal the party was divided into two groups, one officer leading each group. 24 hour rations were distributed, ammunition, a pick or shovel to each man and two waterbottles. Major Wilson also carried an air panel in the shape of an "H" in flourescent material for rapid evacuation by helicopter of any casualty should it arise. He also carried flares, a blanket and ground sheet. The exercise which was to last overnight was to practise patrolling, ambushing, searching ground and routine in a defensive position at night with section and platoon attacks. The ground was very hilly and one group climbed 1,500 feet, carrying their loads, which of course they were not accustomed to and found the going very tough, but managed it with only some minor casualties. Patrolling continued during the night. Ambushes were set, some of which were successful and some not. The way back to the vehicles was down hill and they were glad that a kind Colour Sergeant had tea ready before they got into the trucks to return over the ferry to the barracks. After a wash and brush-up there was much sight-seeing to do, meals to take in the town and generally to watch the world go by. The next exercise was an assault landing on Lantau island, the aim being to carry out the landing followed by the location and destruction of an enemy. The tide was high so when the landing craft's ramp was dropped it was on dry land. The hills were steep but the men were already getting acclimatised. There were skirmishes with the enemy and then lunch on the top of the ridge with a fabulous view. On their return to the L C M the Colour Sergeant, who was 'Captain' of the L C M, took a different route back to Hong Kong Island so that a sight-seeing tour of Aberdeen could be included. The next day was the Queen's Birthday Parade when the 1st Battalion again was the 'Feu de Joie' Battalion, dressed in white with No 1 dress caps. They gave a most impressive salute in front of the Governor. A flypast of Hunters, Canberras, Austers and helicopters terminated a most memorable parade. All the TAER were accommodated near the Press stand and had a wonderful view of the proceedings. It was nearly time to go home. Weapons were inspected and then handed in, to be followed by the olive green and webbing equipment, and the donning once again of civilian clothes. A special lunch at which Cpl A Webb (ACC TAER) had assisted had been laid on in the cookhouse, with the help of the PRI fund, as it was Ypres Day. This was followed by a pay parade and then every man was given time off for shopping, bathing and taking yet more photographs, and a meal out in the town. Next morning, Sunday 28th April, an early call at 0430 hours was followed by a good breakfast before embussing at 0630 hours for the start of the journey home. As it was too early for the ferry service a landing craft took the party to Kowloon for Kai Tak airport, where the Britannia aircraft was waiting on the runway together with many of their new friends to say goodbye. Take-off was at 0845 hours. As the aircraft would be travelling west with the sun, 71/2 hours was off the time of arrival at home. Again there were the same stops flying home as on the outward journey, arriving at Lyneham at 1330 hours on Tuesday, 30th April. The actual time in the air from Hong Kong had been 25 hours. A return to Paddington and home again with memories of the sunshine and the sights, new friends and experiences to provide much to tell everyone! The journey from Hong Kong today takes 11 1/2 hours with no stopovers.